In the late 1980s, Bert and John Jacob were driving up and down the east coast trying to sell their t-shirts to college students and not having much success. During one of their long drives, in between deciding if they should get real jobs, they had a discussion about the media’s focus on negative stories. From this discussion, Jake, the character donning Life Is Good (TM) t-shirts, was born, along with a $100 million dollar business. Legend has it that after graduating from college, Catesby Jones maxed out his credit cards to start a t-shirt company depicting a frog with international flag designs known as Peace Frogs (TM). Today, with the Internet and digital printing resources, starting a t-shirt business is easier and more affordable than ever. In fact, resources exist that allow you to design a shirt using print-on-demand and drop shipping, so you don't have to invest a lot of money or space for inventory. Even so, building a million dollar t-shirt empire isn’t a given. Creating a t-shirt that speaks to the masses and selling it still requires a plan. 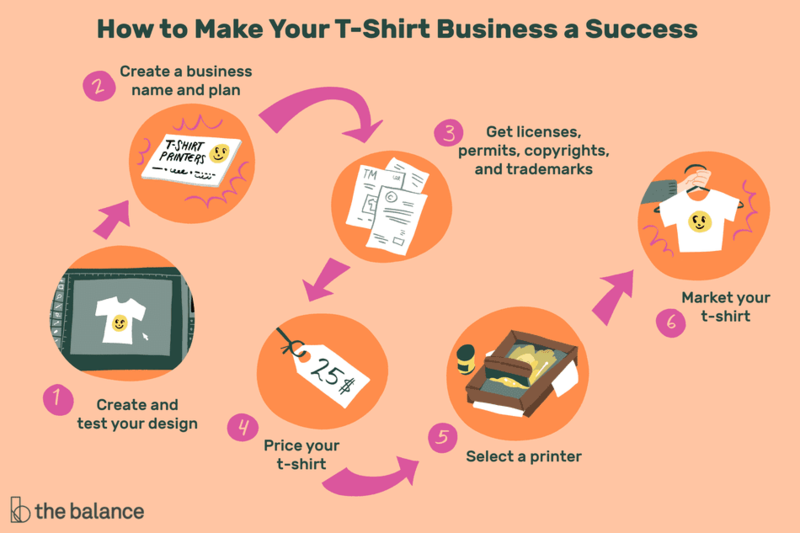 Here are tips and resources to starting your own successful t-shirt business from home. The Jacob brothers struggled with their t-shirts until they finally hit on a basic premise (Life is Good) and the character of Jake. Jones chose the frog because it is a symbol of peace and good luck. It can be difficult to know what sort of design or saying will resonate with the public, so you may need to test different ideas. Further, you need to make sure you don’t use copyrighted or trademarked material on your t-shirts. Be sure to create a high quality resolution design that will look good at the size you want it on your t-shirt. While a design might look okay on your computer, it might not show up well on a t-shirt. You might consider hiring a designer to create a high quality image. Before investing time and money, do market research to determine if your t-shirt will appeal to buyers. First, decide who the ideal buyer for your t-shirt idea would be, and then seek out members of that market to get their feedback on your idea. You don't just want to know if they'd buy your t-shirt, but also, what price they'd pay. Although selling t-shirts sounds straightforward, like all businesses, without a plan, you’ll waste time and money. Your business plan outlines your product, the ideal market, your financial projections and sales goals. 4. Create a business name. You can create and start selling t-shirts online in a matter of minutes, but if you plan to make a living at it, you should create an official business. Starting a business begins with coming up with a business name. Your name should reflect your t-shirt, but not limit your ability to expand on your t-shirt line. While you may set up shop through a digital t-shirt printing company, you may want to set up your own website as well, and for that, you'll want to buy the domain name. 5. Make your business legal. Along with a business name, you need to determine your business structure (i.e. sole proprietor or LLC) and obtain needed licenses and permits. Business licenses are issued by your local city or county business office. If you’re using an online t-shirt service and sell your shirt through its online portal, you may not need a sales tax permit. However, if you’ll be selling your shirts through your own website or in-person (i.e. fairs or markets), then you may need to apply for a sales tax permit through your state’s comptroller’s office. Just as you don’t want to infringe on another company’s copyright or trademark, you don’t want others profiting off your design either. Look into protecting your design, logo and/or slogan through copyright or trademark. Review different t-shirt creation options (i.e. online resources and local t-shirt printers) to find the price you can afford. The price you pay will depend on the size and number of colors of the design, the type of printing you choose, and the quality of t-shirt you select. Based on your cost, price your t-shirt so that you can cover your costs (not just t-shirt expenses, but other business costs such as marketing and other overhead). Keep in mind what the market will pay, as well. You don't want to end up with a price that people won't pay. At the end of this article you’ll find a list of resources that will print your t-shirt . Many offer an online store from which to sell your shirt as well. Another option is to research printing options in your local area. There are many ways to market your new t-shirt, but they all start with knowing the best buyer for your t-shirt (age, gender, etc), where you can find him/her, and putting your t-shirt in front of them. If your target t-shirt buyer is a zombie-loving high school student, market your t-shirt where zombie-loving high school student’s hang out online and off. Marketing ideas include Facebook or other PPC advertising, craft shows or bazaars, Etsy, and ecommerce site.